There the earth has gone down to a depth of 427 m below sea level. In the lowest place there are unique climatic conditions (micro-climate) that make this the largest natural spa in the world and this naturally attracts scholars and visitors from around the world year round. In the Jewish sources (the Bible and the Scrolls) many names were given to the Dead Sea: Yam Ha-Arava (the Arabah Sea), the Sea of Lot, Lake Sodom and the Ancient Sea. The Roman historian Pompeius Trogus, who lived at the end of the first century BCE, wrote: "This is a gigantic lake which from its magnitude and the stillness of its waters is called the Dead Sea". Since then the name "Dead Sea" has become the common name of the Salt Sea in the world. The Dead Sea's properties fired the imagination of scholars and scientists in the nineteenth century, including Theodor Herzl, the founder of modern Zionism, who in his book "Altneuland" described a canal that would connect the Mediterranean Sea to the lowest place on earth, in order to utilize the height differences to create electricity. Scholars from around the world came to the area in order to investigate the phenomenon and contributed to its world renown as an exceptional site on the Earth. Until 1837 nobody imagined that the Dead Sea was below sea level. This was discovered almost accidentally. When this fact became clear, to the surprise of the entire world, the British "Royal Geographical Society" announced a competition between the scientists, to determine the precise height of the Dead Sea in relation to sea level. The possibility that the Dead Sea was the lowest place on earth aroused extensive world interest. The British society's contribution to the study of the subject was decisive. It created permanent interest both in the subject of the height of the Sea and in development of advanced measuring methods, essential for purposes of measuring the height differences. In 1848 it was determined according to measurements by a device called Theodolite that the height differences between the level of the Mediterranean Sea and the level of the Dead Sea are 396 meters, and the height of the Dead Sea below sea level was a fact. In the twentieth century, because of the Sea's retreat, another 20 meters were added to its height below sea level. Today the main industry is concentrated in the southern part of the Sea, where the veteran Israeli potassium plant founded in the 1930s works alongside the Jordanian potassium plant that began production only in 1983. The qualities of the Dead Sea have become well-known universally in wake of the scientific and geographical studies published since the late nineteenth century. Its waters are the saltiest in the world, the historic and cultural sites dispersed around it give it an appealing beauty, combining between the history of the three religions, and the surrounding wild landscape is one of the most beautiful in the world. The area of the Dead Sea, which is at the center of the Syro-African Depression, is distinguished by its macroclimate and unique surface conditions that make it the best natural healing site in the world for various illnesses. In recent decades treatment centers have developed here, which utilize the great medical know-how accrued in relation to the area's natural healing qualities. In the last decade many studies have been carried out to assess the effectiveness of the treatment and the action mechanism of the climatotherapy at the Dead Sea in various fields of healing. On a parallel, the factors of the environment, the climate and all the natural resources in the area that create the "spa" have been examined and analyzed as have the mineral elements serving the cosmetics industry and medicine. The uniqueness of solar radiation in the Dead Sea area is characterized by an ultraviolet (UV) radiation composition which has relatively few short rays (UVB) as against long rays (UVA). The difference in the radiation composition, characterizing the low area, derives from the unique climatic conditions of the Dead Sea area. The weak radiation is a result of the longer path that the rays must traverse until they reach the ground (417 m below sea level) and also the existence of a misty cloud standing over the Dead Sea on most days of the year. Radiation measurements have shown that the UVB (the short rays) radiation spectrum is weaker. Therefore, at the Dead Sea it is possible to stay in the sun longer without sunburn damages caused by the short rays. However, even at the Dead Sea gradual exposure is recommended and during the safe hours of the day (morning and afternoon). The natural screen created at the Dead Sea leaves the rays with the healing qualities for skin diseases, such as psoriasis. This attracts to the site thousands of vacationers seeking a natural remedy for the different skin diseases. In this field, as in the field of radiation, multiyear studies were carried out to monitor the air components and evaluate the different qualities of the atmosphere. Because of the low height in relation to sea level, high atmospheric pressure is created in the Dead Sea area, which makes the air rich in oxygen (6% more than over sea level). In addition the air is rich in mineral particles including in particular magnesium and bromine. Additional factors making the air at the Dead Sea unique are the hot and fixed temperatures most days of the year, dryness in an area where there is little rainfall, few environmental pollution particles (there is little vehicular traffic and few polluting industrial areas) and sparse desert flora that does not release allergens into the air. The Dead Sea is in fact a saltwater lake. Its length is about 50 km and its maximum width, between Ein Gedi and Arnon, is 17 km. The volume of the lake is 140 billion m³ of water, in which about 50 billion tons of salts and minerals are diluted. The concentration of salinity in the Dead Sea is 34 parts to one hundred as against 1.4 parts to one hundred in the water of the Bay of Eilat, which is part of the saltiest open sea in the world. The level of the Dead Sea is in constant retreat. In the last sixty years the sea area was reduced from 1000 km² to 650 km² (approximately 35%). The rate of the level's retreat has stabilized in recent years at one meter yearly, but even though the level is likely to be reduced also in the next few years there is no real danger that the lake will disappear, because of the relative increase in the percentage of the salt and reduction of the surface area of the water - phenomena that suppress evaporation. The Dead Sea's unique composition of natural minerals derives from dissolving of the salt created in the natural evaporation process of the lake's water. The compound is refined through the solar radiation which neutralizes the sodium chloride (that sinks to the bottom) and leaves the compound rich with a high concentration of cation minerals such as magnesium, sodium and calcium and anion minerals such as phosphorus and boron. The high concentration causes high density of the water and consequently it is possible to float on it. 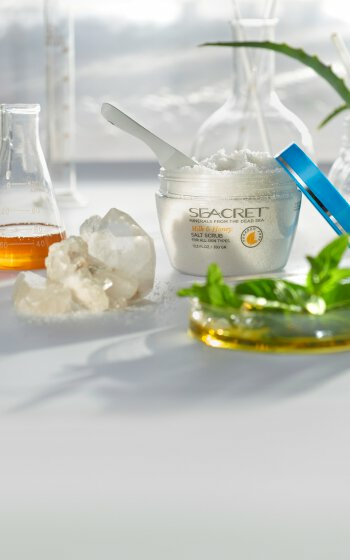 A large part of the Dead Sea salts and minerals penetrate the skin and this makes the Dead Sea the only area in the world in which the natural healing method of climatotherapy is applied for treatment of various diseases. In addition hot mineral springs flow around the Dead Sea shores, natural hot springs that are rich in sulfur and minerals. The mineral composition and the high temperature of the springs make them unique as factors in relief of different types of skin and joint diseases. The mud produced from the banks of the Dead Sea has become famous around the world because of its healing capacities. The black mud (which in its natural form is characterized by a sharp smell) is made up of layers of the mountain soil and silt from the waters of the Jordan River and the springs, and it has sunk deep into the lake. On its way the soil absorbs a very rich concentration of minerals and enriches the lake's waters. 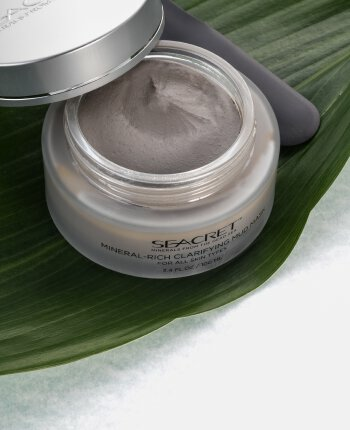 Scientific studies carried out on the mineral mud have proved, beyond any doubt, its benefits in maintaining a healthy skin. The mud has a strong cleansing capacity which absorbs pollutions, fat and secretions from the skin. In addition, it has capacities for rehabilitation, renewal and strengthening of the skin layer and is thus ideal for healing rheumatic pains, relieving symptoms of chronic inflammation and increased dryness of skin, seborrhea, psoriasis and eczema.